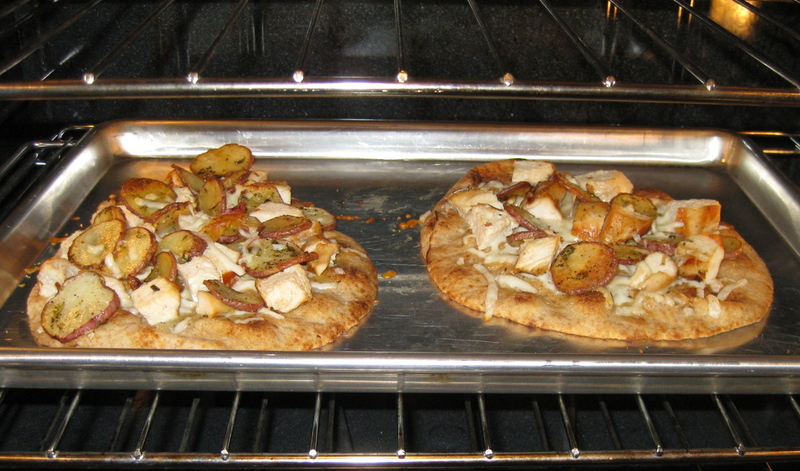 Here is the Rosemary Chicken and Potato Pizza I referenced in Tuesday’s BBQ Chicken Pizza post. My mom and sister made it a few weeks ago. 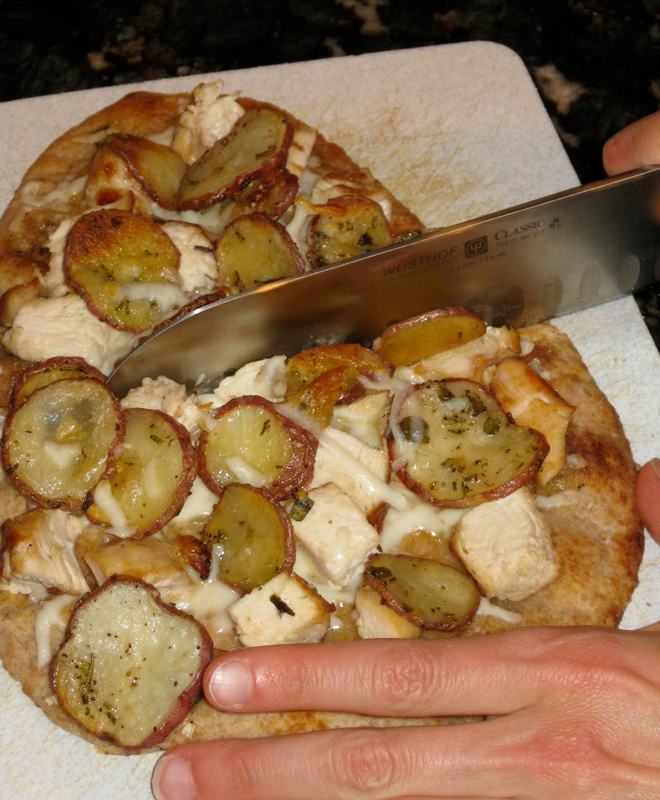 Let me warn you, the Rosemary Chicken and Potato Pizza recipe looks overwhelming, but it is really not that hard. If you have your chicken already cooked, and your dough or pizza crust already made, the most time-consuming part is baking the potatoes. “The time and effort is completely worth it”, my sister says… and she is not one to just love any pizza. This pizza recipe comes from The California Pizza Kitchen Cookbook. Anyone I’ve ever asked who has been to California Pizza Kitchen, or CPK, had nothing but positive things to say. CPK was my family’s Friday night tradition when I was growing up. My parents would split this Rosemary Chicken and Potato Pizza and my sister and I would split a medium Cheese Pizza and then a kids-size Pepperoni Pizza (we were hungry as kids and ate a lot of pizza!) Now that I’ve grown up, I’d probably eat the Rosemary Chicken and Potato Pizza instead…. they say your taste buds change every seven years or so, and I can testify that for you! Again, I’d definitely say this pizza is worth the time and effort, especially when you are making it gourmet-style. Enjoy and let me know what you think! 1. Melt 1 tablespoon butter in a nonstick saucepan over medium-high heat. Add shallot, garlic and thyme. Cook, stirring until mixture is light brown, 7 to 8 minutes. 2. Add salt, pepper, wine, lemon juice and chicken base. Cook until mixture is reduced to about 1/2 cup (toward the end of the reduction, reduce the heat to low and stir frequently to prevent scorching). 3. Remove the pan from the heat; quickly and thoroughly whisk in the remaining 4 tablespoons of butter. 4. Preheat oven to 325 degrees F. Combine sliced potatoes with the remainder of the ingredients; coat thoroughly. Transfer the potato slices to a sheet pan; spread them out in a single layer, do not overlap. Discard leftover marinade – do not pour it over the potatoes. 5. Cook the potatoes in the preheated oven for approximately 45 minutes. Some of the slices may need to be flipped over to promote even browning. Remove the potatoes from the oven when they begin to brown. Use a steel spatula to remove the potatoes from the sheet pan. Place potatoes on paper towels at room temperature to drain off any excess oil. Do not refrigerate. 6. Prepare a hot grill. 7. Combine garlic, soy sauce, salt and olive oil. Marinate the chicken breasts in garlic oil for about 15 minutes. 8. Grill the chicken breasts for 5 to 7 minutes on each side (discard any uncooked marinade). Remove the cooked chicken from the grill and chill thoroughly. Cut into 1/2 to 3/4 inch cubes and set aside in the refrigerator. 9. Place the pizza stone in the center of the oven and preheat to 500 degrees F for one hour before cooking the pizza. 10. Use a large spoon to spread 2 tablespoons of Garlic-Shallot Butter over the surface of the prepared pizza dough, within the rim. Cover the butter with half the mozzarella. Distribute half the grilled garlic chicken evenly over the cheese. 11. Sprinkle half the rosemary and oregano over the chicken. Place the rosemary potatoes over the other toppings, spaced about 1 inch apart. 12. Transfer the pizza to the oven; bake until the crust is crisp and golden and the cheese at the center is bubbly, 8 to 10 minutes. When cooked, carefully remove the pizza from the oven. Sprinkle half the parsley over the hot potato topping. Slice and serve. A hole in the wall: New York Pizza in Aspen! 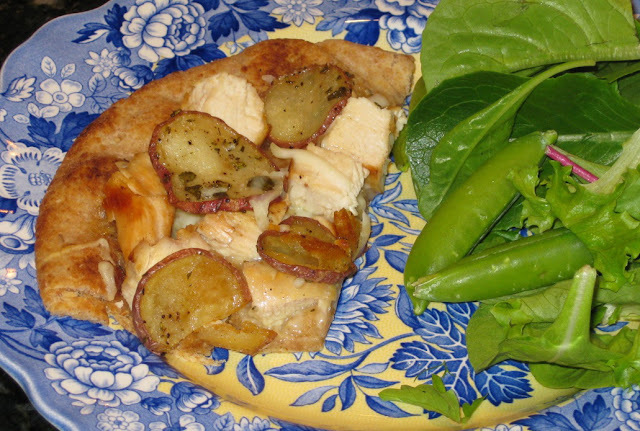 3 Responses to "Rosemary Chicken and Potato Pizza"
Thanks for sharing this recipe it’s definitely a really good reward for my brother who got his Food Handler Certification last week. But still work on the dough first. I’m not really the cook-type but I’d like to do something special for him. Oh, I am so happy you posted this! I had no idea there was a CPK cookbook and that it would be possible to find this recipe. I have missed it ever since they took it off the menu. My own CPK story is that my sister worked at CPK in San Francisco while we were both college students and roommates together. She often brought home her leftovers from the dinner meal she got at the end of her shift which often was this particular pizza and a BBQ chop salad. She often kindly shared her leftovers with me so naturally I very fortunately had plenty of delicious CPK food during my college years. Not bad eating for a broke college student! I’m so glad I thought to google this recipe today and to find your post. I love to cook from scratch and am looking forward to trying the recipe. Thank you! CPK is the best and I’m glad you have happy memories of it with your family as well. I hope you enjoy the recipe. Thanks for following!